Today is Sunday, February 23 and I’m sitting in the cockpit with the sound of,the wind with the halyards clattering in the 12-17kt breeze from the east. We left South Side Marina at 550am trying to leave at high tide, and just getting out of the shallow channel only because Phil powered through the sand to get to deeper water. We are in Sapidillo Bay to stage to leave for the Dominican Republic (DR) on our way to Puerto Rico. There is a rare weather system that is bringing a ridge of High Pressure far south enough later in the week that will bring us wind less than 10 knots we hope. In the meantime we’re waiting here hoping to leave tomorrow morning to go close to upwind to Great Sand Cay in South Caicos and then on to Ocean World Marina, DR, or if we’re lucky enough, the winds will favor us to,get farther east maybe to Samana, DR. We have several boats that will be going over there which is nice to have people around to talk to. Look for the upcoming SPOT messages to track where we are as I don’t think I’ll have internet unless we find a wifi hotspot. I don’t have cell phone at this time with my iPad. This past week have been a bust on our budget, but it’s been nice to be in calm water, have all the electricity we can use, have internet, be around people, and have the kind services of Bob and Cam drive us to the local IGA Grocery store for provision, expensive as they are. They also have a washer and dryer to get laundry done. Nightly happy hours either at the gazebo where there is shade except when the sun starts to set and cool breezes to keep you cool. The view isn’t bad either. While we’ve been here, we met the Captain for Admiral of SV Dover Mists from Port Dover, Ontario, Canada and their crew Joe and Muriel. Our buddy boat Little Wing has also stayed the week. In fact, the Marina was full until we left this morning along with 2 other boats. I have a little story to tell about Joe and Muriel. We got to talking and when we mentioned we were from grand River Yacht Club, Joe mentioned how he had been there when the club flooded and he remember pumps going sucking the water into the River and a big truck coming with an even bigger pump to pump out the water. 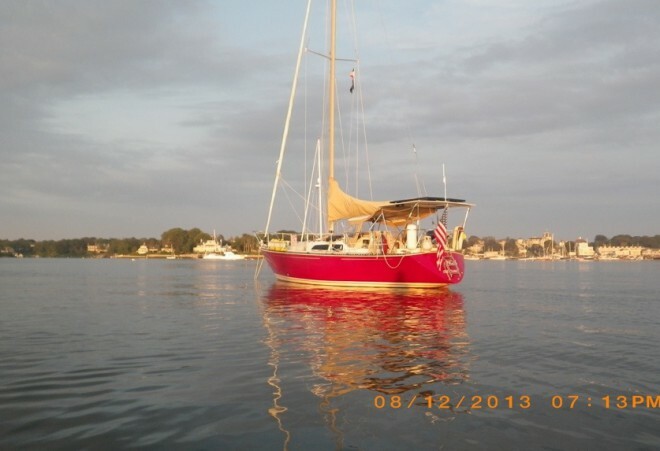 He remembered this red C&C sailboat and a woman telling him not to go where he was because it was shallow. Well wouldn’t you know that was ME telling him and it was Changes that he remembered. After a little while we remember what we looked liked from then. So it’s a small world that you meet someone from home all these thousands of miles away. I had taken videos of the flood and saw them both in one of the videos as Joe joined in to help us out. I can tell that we are in the tropics. The sun is very HOT here even when it’s 5pm and it’s starting to go down. It’s been windy with the eastern trades though we’ve been in a very protected area with the 40ft high ridge of the island between us and the winds. One morning Phil and I took a walk up a road cut into the ridge east of the Marina. We started at 8am just after listening to weather on the SSB thinking that it would be cooler. Maybe it was but it’s still plenty hit. The view was great and it was nice to walk around. This is a nice Marina, but 3 miles away from town so there isn’t any place to go to without a car. You can rent a car for $50/day and they use US dollar here though we didn’t rent one. The T&C’s are very civilized here and it quite the tourist destination. They have an airport close by and the planes leave on a regular basis throughout the day. The local grocery store is like one in the states just very expensive. An orange cost $3.10. Bananas are $1/LB. 5lb bag potatoes is $10 as examples. The cheapest liquor was Turks Rum for $13/liter. All the other wines were mostly $13-15 and up! Phil treated me by buying a 12 pack of Diet Coke with Lime for $9.80. Sunday, February 16 we entered South Side Marina and was docked by 1020am. The immigration and customs official came and accepted their money. $15 extra for overtime in addition to the $50 for 30 days here and typically nothing for the customs. That evening we had a cruisers potluck up at Bob’s at where they have a propane grill. We supplied 4pounds of skipjack tuna filets caught by me and everyone else share a dish or two they had been fixing for supper. BTW, we have over a pound of tuna left over. Monday, February 17 was the day to get work done on Changes. Cam, a Canadian who is,now working at the Marina for the winter season, gave. Phil a ride to,the marine store and on to,the napa Auto Part store where he found a fuel gauge for $40 and a new stern light $18.86. Needless to say, he was thrilled. After his return, he made the needed repairs. While he was busy, I took my laptop and camera equipment to the Gazebo (had electricity and shade with cool breezes) and started working on downloading over 4000 photos, getting about halfway done by the time we needed to stop for Happy Hour. It took a while as I put labels on each group of photos instead of just dates. Tuesday, February 18 as hair cutting day after listening and discussing the weather and when to leave amongst the cruisers at the Marina. I got our my Flowbee and hair clippers and cut Phil’s hair. Bill waited until after he changed the oil before letting Cheryl cut his hair. Cheryl received a hair cut with the Flowbee and then she helped me trim my hair after I used the Flowbee on top. It’s nice to have someone help me and my hair is short enough to last a little while I hope. Later no the morning and into the afternoon, we had on and off rain sometimes lasting 10 min or so, and often lasting 2-5 min, just long enough to wet the cushions if you don’t have the Forehatch closed. Phil also changed the oil for the engine taking EVERYTHING out of the Quarterberth. I re packed the Quarterberth moving some thing off the L. Locker cushion, throwing away some items, but keeping the memory foam mattress for any visitors that may come. Now. Phil has room to stretch out his feet on the starboard settee. By 430pm, we were ready for showers. These showers are unique as the right wall is cut into the rock on the island. The ceiling, if you want to call it that, is a diamond trellis layer flat, so is open to the air. There is plenty of water but no heat to it. At least you feel better after you’re clean. But as we found today, there is no protecting to the rain. They have a spring loaded handle, so the water is on only when pushing on the handle about 6 ft up, so. Phil and I take showers together to hold the water on for each other. At the end of this shower, we had an unpleasant surprise. Just as we were getting dressed, we felt some big drops of rain. REALLY! So we quickly dress and run out the hall(also cut into the rock) to see rain POURING DOWN. I run to the boat getting soaked to the skin. Wouldn’t you know we hadn’t closed the Forehatch or the smile window over the companion way hatch on the dodger? The v-berth bedding got soaked and lot of water at the base of the companionway. Where is Phil? Standing next to the building trying to stay out of the rain!! This rain went on for a while but after stripping the bedding, mopping up the water, and turning on fans to dry things, we went to Happy hour at the bar. Wednesday, February 19 started out listening to weather which changes slightly as each day comes. 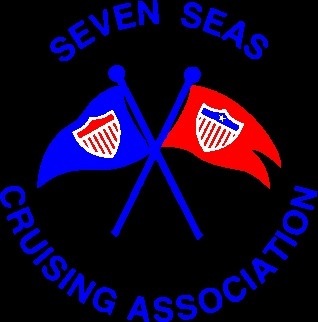 The weather and what day tolerate and where to go to are common conversations amongst us cruisers. We would like to go all the way to PR if we can as today it looks like there will be light enough winds. We talked to SV Truant III who want to more closely follow Bruce Van Sant’s recommendations to get to the DR and PR stopping in Big Sand Cay. Today Phil got enough diesel to fill the fuel tank, which now has a new full set point and all 4 jerry jugs full. We have enough fuel to last 400 nm or so using 15nm/gal at 1200 RPM’s or 10nm/gal at 1800 RPM’s. That’s enough to get us to PR without any stops. Little Wing has enough range to get there also, but Dover Mists doesn’t. While he was doing his thing, I made Tuscan Lentil salad and brownies for the BBQ tonight at Bob’s bar. Seems even the locals like to come as he serves free ice cream after the meal. It works this way; everyone bring their own meat to cook on the provided grill and a dish to share. We had gotten a sirloin steak at the IGA today for our meat. Boy was it good and so was all the food provided. We met some other boaters doing to the DR and PR; SV’s Seaquell and Tomorrow’s Dawn and SV Funny Things. BTW, the brownies were delicious with the vanilla ice cream and enjoyed by all. I looked in my log book for Thursday, February 20 and don’t have anything written down, so must have been our do nothing nonproductive day, though I recall staying on Changes and tackling again importing photos to my laptop and got another 2000 photos imported. I have a little more to go. Phil did tackle working on the ham radio, but wasn’t able to fix it. It has been another day of on and off rain interspersed with blue sky. Phil and I have decided to keep our visits to the bar at a minimum as it’s about $20 for each set of drinks. We decided to have our own and sit under the gazebo then read in the evening. Friday, February 21 brings a big change in the weather outlook for March. Tree is a big dip in the jet stream with strong LO’s pressing into the Bahamas and the Ridge of Hi pressing south enough to bring light and variable wind to the East Caribbean cutting off the trades, bringing some north winds and good weather windows to get east. Now we have to wait while the stronger current winds moderate and the predicted light winds come. Phil fixes the ham radio so we can call out on the frequencies that we need down that we are further south. We have the rare pleasure to FaceTime with Victoria, nick, Henry and Calvin from LA. I work on Katie’s sweater. Then at 1215pm we go with Bob and Cam to the IGA and then go to the Tiki Hut for lunch out on the north side of the island. It reminds Phil of Florida he says. To get home, we take a jitney cab. We wait on the side of the road and hail cars to get a lift. The first one doesn’t know where South Side Marina is. The second is a Van and wants to charge $15 each when we’ve been told it should be for $4 each. We wait a little longer the another guy pulls up. He charges $10 each and. Phil accepts though I want to bargain but don’t. On the way we get $20 worth of gas. It’s over $6/gal here. We spend the rest of the afternoon at the gazebo staying as cool as possible. We have decided to have movie night at the gazebo and “The Quiet Man” with John Wayne and Maureen O’Hara is going to be played. Cheryl fixed popcorn and with the 8pm start time we get to bed late. The winds have been higher today and it’s been decided that it looks like Monday is the day to leave to cross the banks. Customs will come Saturday afternoon to check us out of the country. I spends Saturday, February 22 cleaning out and defrosting the refrigerator. Some of the juices from the tuna leaked out and the fish smell is strong. Now it’s gone thank heavens. Then I spent the better part of the day making coleslaw! a bean, corn and tomato salad and making bread. And we heated up the left over brats and cabbage and rice for supper. While the bread was on it’s second rising, I took a nap having set an alarm to wake me to turn on the oven and then to put on the oven. Then after it was cooling, I relaxed at the gazebo waiting for the customs and Immigration officials to arrive. We have decided to have another movie night and watched “The Naked Gun” a favorite of Joe on Little Wing. Then it was time to go to bed as we have a 530am wake up to leave the Marina at 6am for high tide. We still plan to leave Monday for going southeast across the banks. Sunday, February 23 When we woke the winds in the Marina were 6 kts, which is good. Bill from Dover Mists helped us guide Changes out of her slip since we have a very close fit with the power boat next to us. Very quickly when we enter the channel we hit, Phil initially backed up, but we literally push our way past the red nuns. The high tide was going out, but we made it to deeper water. The high tides haven’t been as high as when we came in. It wasn’t too long that we were anchored in Sapodilla Bay and bouncing from the 12-17kt east winds which seem to increase in the afternoon. I took and nap and after waking look for Katie’s sweater to knit. Turns out I left it at the Marina. Lucky for me, Cheryl on Dover Mists found it and will bring it with her. We have arranged to meet by the reef as they are leaving tomorrow morning so she can toss it to me as we pass in the big boats. I have spent today working on the blog post, reading and trying to ignore the bouncing. I’m thankful that I didn’t have to spend the week on the hook during the high winds!! Our first challenge upon leaving is to get across the Caicos banks, then to cross to Big Sand Cay which may take all day from a current that runs from the north to south. Then we cross to the DR (Ocean World Marina) or if the winds are light enough, to Samana, DR further east. From here until we get to Puerto Rico is the least pleasant part of our trip. I’m really hoping that the winds do become <10 kts for 24-36hrs at a time so the we can make this easting as pleasant as possible. We need 72 hours to get to Puerto Rico which is 360 nm at 5kt/hour. Just so you know, I update my Facebook page SV Changes, when I have so so internet. Also follow my SPOT locations to know where we are. When we are in a passage, I try to do an OK message about every 3 hours. This entry was posted in 2014, Boat Projects, Canada, Cruising Friends, Marinas, SV Changes and tagged boat Little Wing, Chris Parker, Cruising friends, DR, fishing, Happy hour, IGA, Ocean World Marina, Phil, PR, Preparations, Puerto Rico, Restaurants, South Side Marina, Tuna. Bookmark the permalink.